Roseate Spoonbills are among my favorite birds to watch and paint. They are a strange combination of beautiful colors and unusual looks. They have a face that only a mother could love, but the rest of their appearance makes up for it. On a recent trip to Florida, with my friend Kalon Baughan, "spoonies" as we call them, were on the top of our list of target species to photograph. In this particular situation we were wading out in the water at low tide with the spoonbills as they fed around us in the shallow bay, along with snowy egrets, white ibis, and reddish egrets. 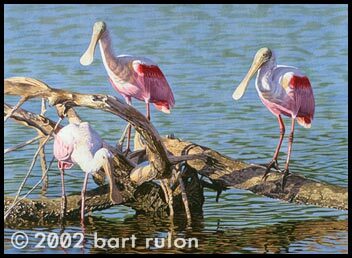 The spoonbills' gregarious nature provided us with many different group situatiions and behavior to paint from. This painting sums up one of the rare quiet moments when the birds took a break from morning feeding to hang out some driftwood.